Your work is fabulous !!!!! Hey the artwork here… and humor. This beats lengthy monologues … looking forward to your book, still! thanks Rayla 🙂 for liking the work ! I WIll buy sir ! Your illustrations/sense of humor… cmon, you shud be in the papers… no flattery here. This is genuine talent. Oh wow. That’s talent and heart ! Would love to do a write up on you. WhatSay? 20 questions. Game ? I do not follow much of cricket . Well i know it sounds cynical specially when you are the citizen of a country that worships cricket. But yes your post has updated me with the current status of cricket. 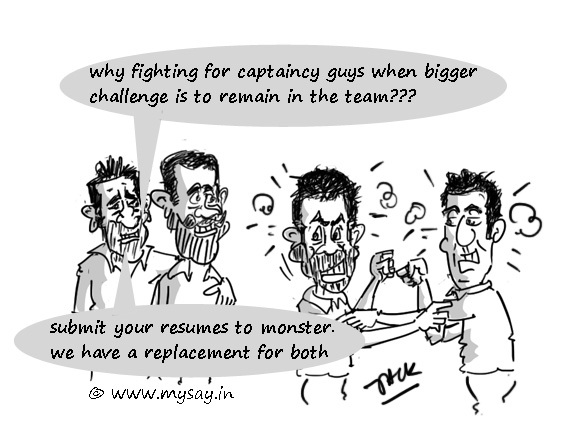 Good one as always Mysay…. u have a great sense of humor and immense talent too …..
both are great players for the team.